Home health aides offer regular assistance and support on activities of everyday living. When people face the challenges of chronic illness, disability, or old age, they might not be able to perform the essential daily tasks that improve health and well-being. In their physically weakened state, your loved ones need to focus on getting better and fighting whatever illness or condition is plaguing them instead of dividing their attention to other tasks, and worse, engaging in them without any assistance. Home health aides allow our clients to rest, relax, and do whatever helps them conquer the effects of their disease. They help our patients focus on living their lives by assisting them in matters that are also essential to their recovery. For questions and inquiries on this particular service, you may reach to our agency at your preferred time. You may call us at 218-435-1044 or send a message to tyler.mcglynn@bethanyinc.com. We’re always looking to be of assistance to you in any way we can, so please don’t hesitate to get in touch. 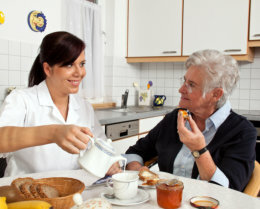 Our highly skilled and dedicated home health aides are always ready and willing to be of service to you and your family!